Multiregression Dynamic Models for directed dynamic functional brain network analysis. The aim of this package is to study directed functional connectivity in fMRI. Multiregression Dynamic Models (MDM) belong to the family of Dynamic Bayesian Networks. MDM searches through all possible parent nodes for a specific node and provides an interpretable fit in terms of regression model for each network node (Costa et al., 2015). Current research aims to fully characterize MDM using simulations and big data from the Human Connectome Project (HCP) in order to test validity and different aspects of reliability (test-retest reliability, out-of-sample reliability) in order to make this new method available for neuroimaging. Costa, L., Smith, J., Nichols, T., Cussens, J., Duff, E. P., and Makin, T. R. (2015). Searching Multiregression Dynamic Models of resting-state fMRI networks using integer programming. Bayesian Analysis, 10(2), 441–478. doi:10.1214/14-BA913. Smith, S. M., Miller, K. L., Salimi-Khorshidi, G., Webster, M., Beckmann, C. F., Nichols, T. E., et al. (2011). Network modelling methods for FMRI. NeuroImage, 54(2), 875–91. doi:10.1016/j.neuroimage.2010.08.063. Schwab, S., Harbord, R., Costa, L., Nichols, T.E. (2017). multdyn: A package for Multiregression Dynamic Models (MDM). Available at: https://github.com/schw4b/multdyn. The installation with dependencies is approx. 86MB. We load simulation data from Smith et al. (2011) of a 5-node network with 200 samples (time points) of one subject. Time series should be mean centered. Now, let's do a full search across all possible parent models of n2(n-1). Here, with n=5, we have 16 possible models for each node. The table colums are the 16 different models. 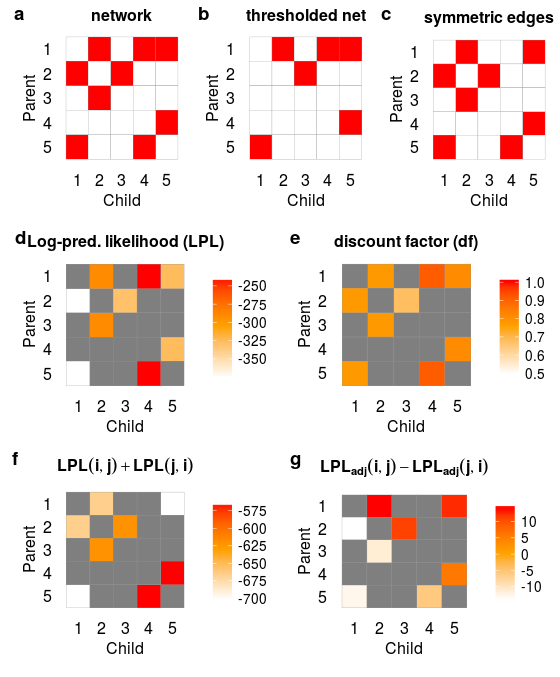 First row indicates model number, rows 2-5 the parents, row 6 the log predictive likelihood (LPL), and row 7 the discount factor (delta). To get the winning model, we simply maximaze across LPLs. We do a full search on the subject level (exhautive search on each node). The list returned contains all the models (models), the winning models (winner), the adjacency matrix of the network (adj), and a thresholded network (thr). The thresholed network is a reduced version of the network, favorizing the simpler model by comparing the Bayes factors. If the Bayes factor between the models (symetric edge vs. asymetric edge) is similar, the simpler asymetric model is favorized. The adj structure contains the adjacency matrix of the network (am, Fig. 1a), the LPLs (lpl, Fig. 1d), and the discount factors (df, Fig. 1e). The thr structure contains a matrix of edges that are bidirectional/symmetric (bi, Fig. 1c), the two matrices of LPLs with the first containing LPLs for bidirectional edges (Fig. 1f), the second contains adjusted LPLs (Fig. 1g) for asymetric models (after removing one or the other of the symetric edges, and the thresholded adjacency matrix (am, Fig 1b). Estimates for a time-series with 1200 samples (HCP), and for a 2.8GHz CPU.